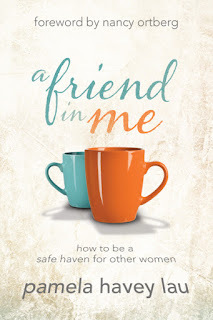 For the past few weeks, I’ve been reading A Friend in Me by Pamela Havey Lau. Subtitled How to be a Safe Haven for Other Women, this is not exactly my normal reading material. I have reached the point, though, where I really should be acting in a mentor role, an older woman role, and I am starting to have those opportunities. I thought this book would be a good way for me to be more intentional about those chances. Young women long for relational connection with women further ahead of them on the journey. Yet, without realizing it, many of us tend to distance ourselves from those in younger generations. Can we really have close relationships with women who have different thoughts on church, different experiences with family, and different ways of talking about God? Where do we start? 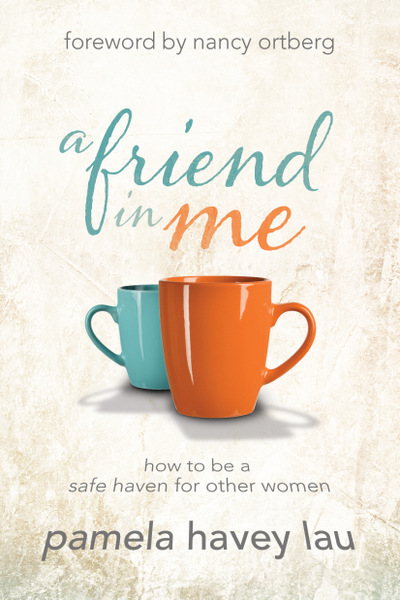 In A Friend in Me, Pam Lau shows you how to be a safe place for the younger women in your life. She offers five patterns women need to internalize and practice for initiating relationships and talking about issues such as faith, forgiveness, sexuality, and vocation. Most significantly, she reminds you that there doesn't need to be a divide between generations of women. Together, we can have a global impact---and experience a deeper faith than we've ever known. I think this is a hugely important message, and I’m glad it is getting out there. But I struggled with this book. And that probably proves how much I needed to be reading it. I don’t know. There were parts that really resonated with me. The chapter on grief (The Power of Comfort), for instance. Or the chapter on compassion. But a lot of it made me feel guilty and like I’m not trying hard enough or that I’d never be capable of being enough. It felt like all the pressure is on me to be discerning and non-judging so I can speak life into the younger women I encounter in my life. And I suppose this is written to the older women, but it just never felt like the younger women were expected to do anything in this relationship except to be there, soaking up the encouragement offered to them. I feel cynical just writing that. Maybe at a different point in my life I'd be better with this book. Right now, I just feel stuck with a generation of older women who have always been far too busy to bother with anyone younger than themselves, and a generation of younger women who -- according to what I'm reading here -- expect me to be the one noticing when they need an older friend, and for me to always respond perfectly no matter what because otherwise I'm being judgmental. Not that this totally tracks with my real life. I have had some older women who are fantastic encouragers, and I do have some younger women who don't seem to think I'm solely responsible for a relationship. I do think there is a lot of great insights in this book, and maybe revisiting it in another few months might be good for me. Go see what others have to say about this book at the Litfuse Blog Tour page!